Made of 100% recycled PVC construction, our versatile 'L'-shaped design paver edgings keep pavers in place for the life of your projects, easily install under or outside pavers, allow for healthy turf growth alongside pavers and simply bend to make beautiful curves without the need for cutting. 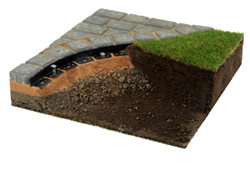 Constructed of 100% recycled polyethylene, our round top lawn edgings provide long lasting quality on the job. They divide turf from planting areas, keep mulch & stone in place and minimize hand trimming and lawn edger use. Constructed of 100% recycled materials, our low-profile lawn edgings provide nearly invisible borders and clean, well-defined bed lines. 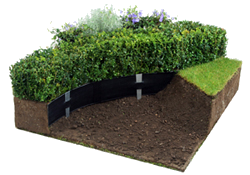 With no sharp edges, our lawn edgings are a safe alternative to metal, wood and concrete edgings. 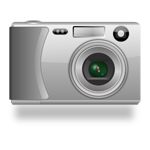 They are easy to heat to form logos and patterns. 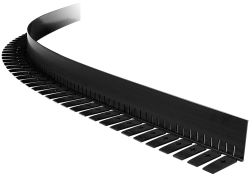 Made from 100% recycled PVC strengthened by impact modifier and UV inhibitor, our specialty edge restraints are available in 6” and 4” heights with 1.5” drainage slots on its vertical base and engineered to keep green roof materials, stone walkways & permeable pavers in place. 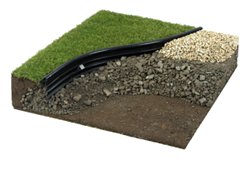 Our accessories keep the edgings connected and in the ground where they belong! 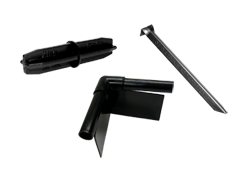 To complement each of our edging products, we offer high quality anchoring stakes and connectors. 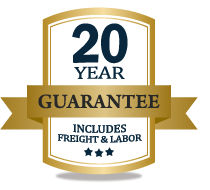 Our “Made in the USA” stakes and connectors are manufactured with the same care and quality control as our edgings.